For a long time on our project there were no realy BIG Hight Five / Gracia Final servers. This fall, the largest projects came together to create a truly impressive server (Triple-A class among on all free l2 projects), with a huge number of players from around the world, based on the Gracia Final. We can not stay away and are pleased to announce that we will take part in this! Starting from 78 level of monster - from x7 to x4 gradually. Premium Account provide +30% personal EXP and SP bonus. Please note! Rate of Attribute means the chance of droping stones, not q-ty. Premium Account provide +25% to ATT drop chance rate. Amount of items from fountain at SoD / SoI - х2. PS: Transformation scrolls drop rate (chance) from Raid Boss is fixed - 7%. Seductive Whispers - items drop х1, reward х1. Drop Anchient Tome of the Demon - x2. Premium Account provide +50% to amount of droped Epaulettes. Premium Account increases amount of Fame at PvP zones (Castles, Fortress, Captured Clan Halls) on 50%. Amoun of droping Anchient Tome of the Demon - x2. All clan leader can use special clan invitation message (command: .pledgeannounce). Soft (3rd party software) - permanent blocking of game characters. Clan Halls auction - 2 November. Rules to visit Frintezza has been changed. Now each group that want to enter inside should reg separately. Entrance available for 4-5 groups, without minimum party member limit. Please note! Each party leader should have Frintezza's Magic Force Field Removal Scroll to reg his party. All Epic Raid Bosses are dead from the server opening. First respawn should be counted from the servers Grand Opening, for example first AQ will appears in interval of 24 to 25 hours from the server Grand Opening. Valakas - 11 days, without random. All Raid Bosses are alive from the server opening. Regular Raid Bosses - from 12 to 20h. If at farming Epic taking part characters 2 or more level higher then Boss (43+ on AQ, 63+ on Zaken etc) - it will cause to reduse the drop chance rate. In case if at farm of Zaken took part character 63+ and there was no drop of the earring - Administration will not provide the drop manualy. Epic Jewelry, Vesper items and other pretty unique items, which was received from the Clan event - are items that has received during the regular game stream, which mean that if player or party (group) will decide to change the clan\side during the server - administration will not take any moves to returne the items to the clan. In case if player or party take Clan items fraudulently (under false pretenses, for example for olympiad or daily pvp) and then leave the clan\side - administration has allrights to return items to the Clan, as we treat this as scam. RMT is prohibited and will cause to permanent blocking of the character. In case if player or group have sold it's item for real money and we have all necessary proves - we will block the character(s) immediately and will took the items from the buyer. We can also considered to return items to Clan in specific cases. First Heroes - 26.11 - 02.12. Price for BEAB, BEAA, BEAS has been decreased in 3 times. Quest How to Oppose Evil (Books, rec Icarus, II Essence on Gracia) - amount of gathering items has been increased in 2 times, price of books has been decreased in 2 times. Amount of 150+ ATT items from fountains at SoD - has been increased in 2 times (0-7). 100% - Holy Spirit's Cloak. Amount of 150+ ATT items from fountains at SoI - has been increased in 2 times (0-7). The new Clan Unity buff is being automatically applied every 5 minutes to characters who are members of a clan. If a clan online is 27-35 characters - Clan Unity 2 lvl. Will not work on Olympiad Games. Can be learned at levels 60. Cannot be used when a bow/fist weapon is equipped. Requires a sword or blunt weapon to be equipped. After re-summoning of your summon - the buff will be still on it. will not take any buff slot anymore. All you need is to have a quest "Enchange Your Weapon" and Soul Crystal of certain level in your inventory. 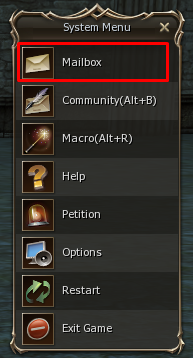 To open your mail press on "Mailbox" at main menu (Alt+X). To open you mailbox press on "Mailbox" at general menu (Alt+X). Then press "Send mail". You can attach up to 8 items to your mail (same type of items will stick to 1 slot). Fee of the mail will depend on amoun of items that has been sent. 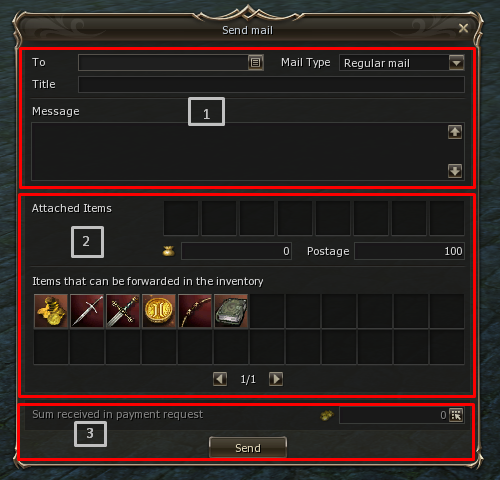 You can send and receive mail only if you are not in combat state and at peaceful zone. After you have send the mail - you will have 30 sec while it "on it's way to receiver" to guarantee cancel it (mail) by deleting at "Sent Meil" menu if you have changed your mind. 2 - Attached Items. Here you can attach items by moving it from your inventory (maximum 8). 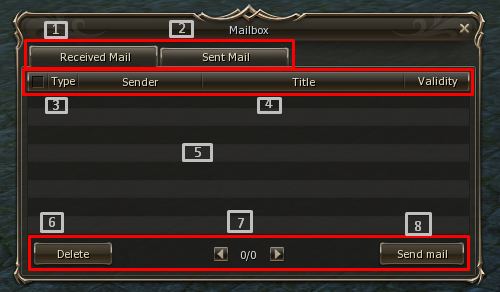 After you have sent your mail it will appears in "Sent Mail" menu. If receiver didn't accept or didn't get (30 sec after you have sent) the mail - you can cancel it by pressing "Delete" on the mail. When you receive mail - special icon will appear under your chat at left corner. If the weight of the attachment if more than your characters weightlimit - you will not able to claim it. If you don't have enough adena - you will not able to claim it. If you have enough adena to pay for the attachment - adena will be immediately sent to the sender and you will claim the item(s). Special for you we have prepared new unique achievement system! They were designed to ring the changes into the daily gameplay. Sky is the limit: reach 85 level. Pinata: take part in 7 and/or 15 battles at the Olympiad (the counter of battles accumulates during the day, relogins are not taken into account). Perfectionism - Get the 3rd subclass. Jack the Ripper: Get 1000 PK. Nolifer! : to stay in the game for 12 hour. Now your macro is in cyclic mode. 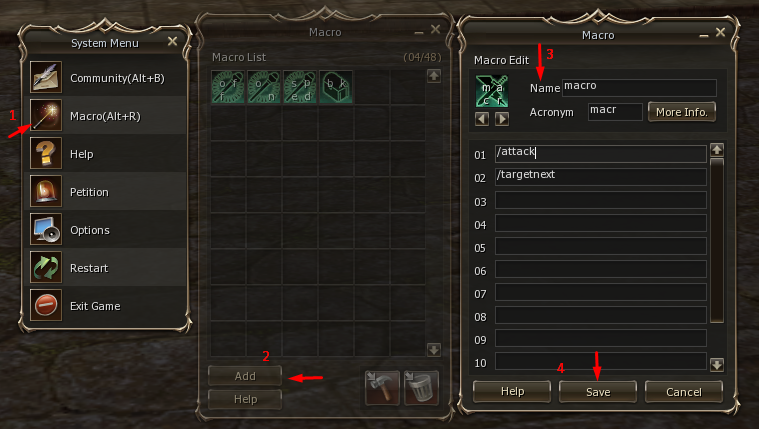 Please note, you can't set 2 macroses on cycle mode, as well as any action will deactivate cyclic macros. Near Gatekeeper at every town, as well as at startin village and on Gracia continent - you can find NPC Global Manager (updated Newbie Helper). This NPC will provide you with Magic Support, Daily Quests and rewards for them and they will manage of upcoming events. Default Magic Support available for characters 1-75 level, if you have Club Card - until level 85 (included). however 3rd class skills and Dances\Songs are not going to be at Magic Support buffs. We have prepared personal daily quests. You can get some useful bonuses for your character. Ivory Coin - 30 q-ty. Ivory Coin - 50-250. Amount of coins depends on the level of chosen location. Quest mechanics: Player who did last hit takes reward. If player was in party or command channel reward is divided equally for each party member. You will be able to find more regarding the assortment on OBT. Detailed event schedule we will announce before the server opening. The description is not final and can be changed. All changes will be announced. -can anyone enter the beta or do you need invite? -is it just a one day test or will it be an open beta lasting from October 12 to October 26? -if it's a full open beta launch will there be wipes at the October 26 launch? 7x sounds really good. I'm sure there are a lot of people like me coming here from the failed official l2 classic launch seeking a classic experience. I love classic but i really miss catacombs and new maps like Valley of Saints and everything that was available in the old dex server from quite some long years ago. I think we had Scions of Destiny update back than, not sure. I'm not familiar with Gracia, does anyone know if i can experience a somewhat classic experience in Gracia? I'm not really a fan of instances, can i just ignore them and farm mobs in the open world like the classic way? Also the key to a long lasting server is the economy, as long as people can farm and sell their mats to someone, they will stay. So pls help buyers and sellers as much as you can, i really want to find WTB shops to stay, not just sellers. I know that depends on us as a community but me personally i will stay even with low numbers if there are still people who buy materials not just everyone selling and no one buying. is this a team up project with eglobal? Or just dex? please someone send me a link or something...? like spoiler doesnt have mass spoil.. interlude vs high five..
read patch notes and you will know what they added or removed. Easy. i downloaded client / patch / updater…..created game account......but lineage2 doesnt launch…. Is server offline? thought beta was running till 25 okt.? Or do i have to wait till 26th 20:00 GMT+2 till i can log in? Server looks to be good. Any one have idea about expected online? It`s very calm on forum. Still full of Virus. Plz Fix it.